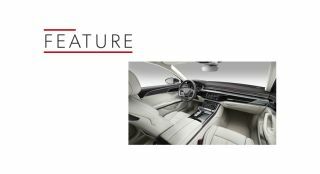 Behind the scenes with Bang & Olufsen and the new Audi A8 | What Hi-Fi? But first, a brief history lesson. The two companies have been in cahoots since 2005, when B&O's first car audio system featured on the 2nd-gen Audi A8 saloon. A decade later, B&O's 3D sound technology made its debut in the Audi Q7. It saw B&O height speakers appear in a car environment for the first time, using a Fraunhofer Symphorium algorithm to help create three-dimensional audio effects. Fast-forward to the 2018 Audi A8 and you can tick the options box for the very the latest version of B&O’s flagship set-up. The 3D Advanced Sound System boasts 23 speakers, 23 channels of amplification, 1920W of power, and a new arrangement of height speakers. Not only do they appear in the car’s A-pillars, they're also built into the roof lining for the first time, just above the rear doors. The system also uses a new version of the Fraunhofer Symhorium algorithm. And we've had a listen. Fresner makes the point that Audi’s A1-A8 ranges attract different customers with different needs and expectations and, as a result, the audio is tuned slightly differently for each car segment. Christian Rückhert is Audi's Head of Loudspeaker Development and his department is responsible for the specifications for all the speakers used in the car. Once the general spec of the system is decided, the first part of the process involves outside suppliers submitting various acoustic samples for testing. Rückhert then uses Klippel measuring equipment and software to help select the drive units. With the driver positioned in a rig, a laser is pointed at the centre of the membrane to measure excursion. A power voltage and multi-tone signal is then fed into the driver to measure the current going through the speaker. "Having both measurements helps you to calculate the moving mass, stiffness of the spring and the magnetic field strength." Audi's sound engineers also have access to a dedicated anechoic chamber, which Audi uses to take the acoustic measurements of the drive units. Distortion is measured to keep the in-car sound as neutral as possible and measurements are taken on- and off-axis, to see how different drivers react. Once a supplier has been decided, the car and the speaker components are developed in parallel with the aid of Audi's Sound Lab. Prototype speakers are created, after which B&O tunes the car on site for three to four weeks. It’s then sent to Fraunhofer in order to program the 3D algorithm. The car then moves to the test track, where adjustments can be made to compensate for the sound of the engine and external noise. Audi even has its own listening room, complete with a couple of different systems and speaker configurations. The engineers use the room to listen to stereo and multichannel audio to help render instruments and vocals as accurately as possible in the car. Genelec monitors are Audi's go-to speakers for surround and 3D audio, while stereo duties are shared between a pair of Wilson Audio Watts and active ATC floorstanders. Wolfrahm Jähn is the main project manager for the car's new system and he takes control for our private listening session. He's keen to explain why the A8's 3D speakers are so important. “When you drive, some surround systems can collapse as the noise levels outside increase, so having the 3D speakers help keep it up. “The Fraunhofer Symphorium algorithm looks at a musical piece and tries to find elements which give an idea of height in the room. It extracts the signal and puts it through the 3D loudspeakers.” The process is designed to give the impression you’re sitting in a space with a much higher ceiling. What about hi-res audio? Does it have a place on four wheels? Jähn points out the system can handle a wide range of audio formats and bitrates, but anything over 24-bit/48kHz is downsampled. We weren’t allowed to drive the car to see how the audio stood up to wind, road and engine noise, but we were treated to a few choice tracks and a demo of the 3D audio. With it turned on, the sound certainly appeared to have a greater sense of height and spaciousness. Turned off, the soundfield appeared to drop down from the roof, you lost a little in terms of immersion, and the impact of the door speakers became more apparent. The tonal character seemed similar to systems we've heard in B&O-equipped Audis such as the TT and R8, but we'll be bringing you our full verdict in a review of this system later in the year. Here's hoping the attention to detail throughout the development process helps deliver a suitably impressive in-car audio system.